Rear Suspension Dual shock absorbers adjustable for spring preload, 100mm wheel travel. 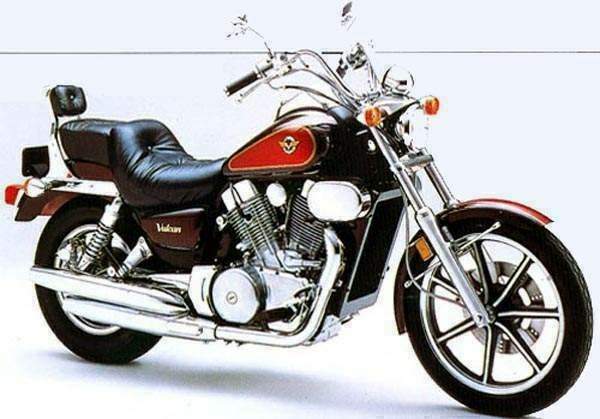 Kawasaki's take on the massive cruiser concept has a long history - the first VN1500 appeared in 1988, and has remained basically the same since. The massive V-twin engine at the heart of the VN is a rather high-tech design. Liquid-cooled, it has four valves per cylinder, and a single overhead camshaft per cylinder, while the latest model, since 2001, has been equipped with fuel-injection. But for all its technology, the engine feels rather asthmatic, producing only 48kW (65bhp), although it is very torquey at low revs. The chassis is a typical cruiser design - a low seat and pull-back handlebars give a cruising riding position. The chrome air-filter housing, dual exhausts and valanced mudguards make the VN look like an authentic US cruiser.